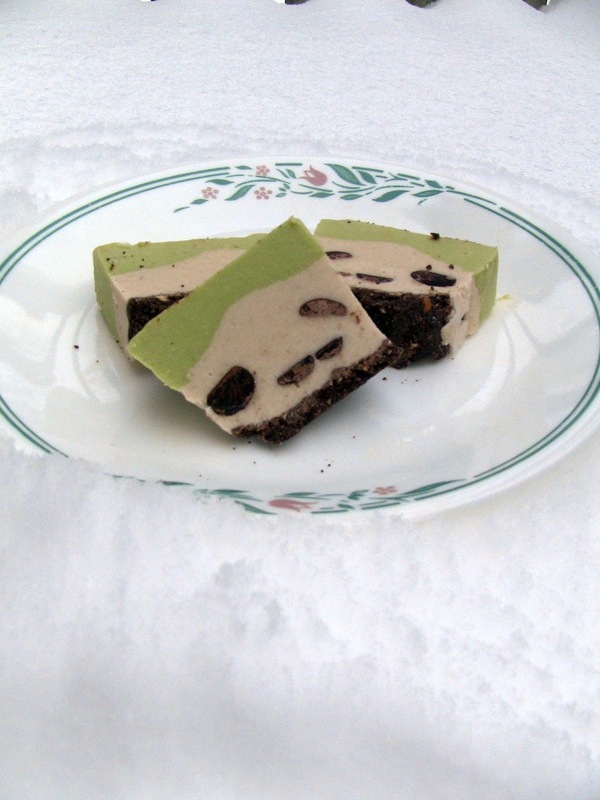 Christmas is almost here, and to finish off my 12 days of Cookies, I introduce to you the raw Grasshopper Pie. This pie is a combined spin off of my Key Lime Pie and Pumpkin Pie Cheesecake. You really can’t go wrong with this beautifully perfect layered pie of chocolate, vanilla and mint. Smooth and silky, it’s the perfect dessert to end a holiday meal. Garnish with sifted cocoa powder or shaved dark chocolate if you’d like. DELICIOUS! 1.) THE CRUST Line a 9 inch spring form pan OR 8×8 inch glass dish with all natural parchment paper. In your food processor, add all crust ingredients and pulse until it is of uniform consistency. It should be crumbly. Transfer your crust to to your parchment-lined pan and press firmly and evenly to line it. Set in fridge to firm slightly while preparing fillings. 2.) THE CREAM LAYER Soak raw cashews at least 2 hours. Rinse soaked cashews under filtered water until water runs clear. Place cashews, coconut oil, coconut milk, liquid stevia, vanilla extract and sea salt into food processor. Puree until smooth. Should be spreadable. If too thick, add filtered water 1 Tablespoon at a time. Transfer to medium bowl and stir in cacao nibs. Spread over the pie crust and place in FREEZER to set while preparing Mint Layer. 3.) THE MINT LAYER Soak cashews at least 2 hours. Rinse under filtered water until water runs clear. Pour drained cashews into blender. Spoon avocados into blender. Add liquid stevia, vanilla extract, mint extract, almond milk and coconut milk. Blend on High for about 1 minute (stirring thru hole in lid with a wooden spoon as needed). Again, mixture should be smooth and spreadable. If too thick, slowly add in more coconut milk. I recommend adding 1/4 cup at a time until a creamy consistency is achieved. You should not need much extra. 4.) 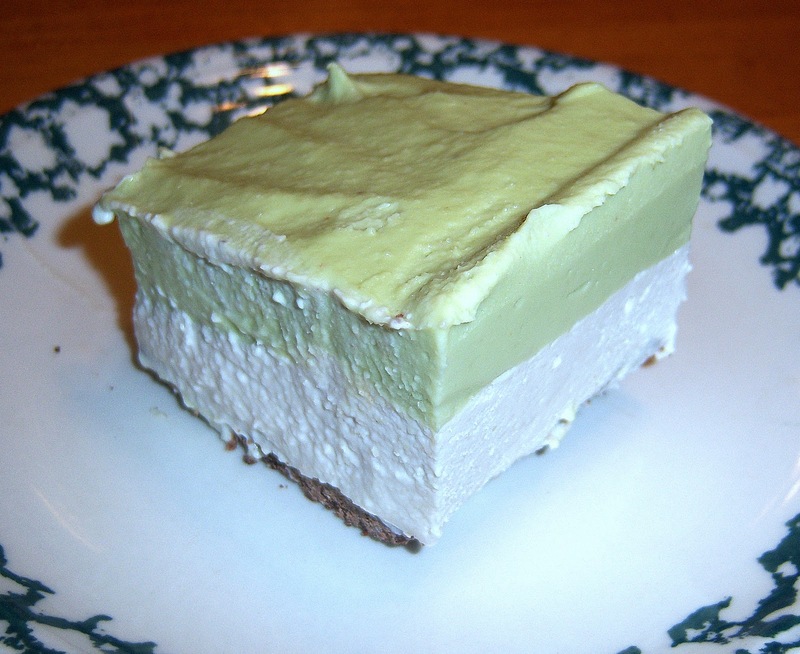 With a spatula, spread avocado puree over the cream layer and spread smooth, avoiding lumps. Place in freezer for 2 hours prior to serving. Thanks Dr. Drew Kaminski for this photo in the snow. I hope you will love it!! What are some other pie/cheesecake combinations you are dying to enjoy on your Maximized Living Nutrition Plan?? This looks great! Any chance you could substitute almond butter for the cashews? Just curious! It could be worth the try, Lauren. I haven’t done it myself. I’m certain it would change the taste quite a bit, simply because cashews are so mild in taste. The cashews are also higher in fat, so they give off this cream cheese like texture to the pie, which may change drastically by subbing almond butter. I would think coconut butter would be a better choice if you’re going to sub something for the cashews. Have fun experimenting! Thanks! I’ll try it with coconut butter! It’s worth the try! Come back and let me know how it turned out for you! Ever done pecan/chocolate pecan pies? Not a huge pie fan, but I love pecan pies! Hubby loves pie period, so we could agree on that one. This looks good too, it reminds me of a key lime cheesecake!!!!!!!!!!!! No, but that sounds DELICIOUS!!!! I don’t know when I’ll get around to making that Core/Advanced Plan, but you’ve got my mouth watering Megan!